In 1819, ESCP Europe Business School a private company of a special kind is established: one of the very first business schools, and now the oldest business school in the world was created. A bold policy of international openness (more than 20% foreign students as early as 1827-1828), with educational content, addressing international issues (three foreign languages taught from 1823; study tours in Europe from 1826-1827;). This was a true feat in France in the context of post-Napoleonic-wars society! In addition to management science and technology, students study law and political economy, or applied sciences (chemistry). ESCP Europe's multicultural and multidisciplinary model is already emerging. A location at the heart of economic capital (Hôtel des Fermes, then Hôtel de Sully, in Paris). This early phase is shaped by its builders: entrepreneurs such as Germain Legret and Amédée Brodart, and scholars such as economist Jean-Baptiste Say, theorist of the concept of entrepreneurship; merchant Vital Roux, contributor to the conception of the French Commercial Code and promoter of a pedagogy oriented towards practical teaching; and economist Adolphe Blanqui, owner and director of the school for 24 years. The ESCP Europe Executive MBA programme is for managers and executive who are ready to transform their current and future careers. Our commitment is to ensure that our participants are constantly evolving and prepared for the fasted-paced technology and organisational challenges faced today. 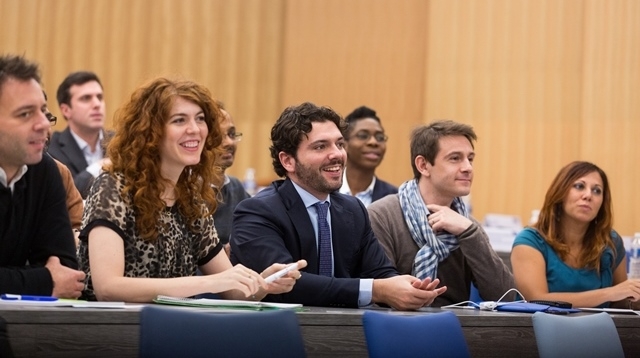 ESCP Europe prepares the leaders of the future offering practical and industry-ready skills. It is crucial, to expand your skills, knowledge and international network. We are committed to experience and development. #1 worldwide for "Career progression"
#2 worldwide for "Aims achieved"
#3 worldwide for "International course experience"
A fast-track path to join our Executive MBA programme. A blended format, combining distance learning (for 7 courses) with in-class sessions (2 courses) over 18 months. It allows you to progress smoothly to the full EMBA* curriculum within 30 months. *Upon acceptance after your GMP, you will need to complete the 10 electives, 5 international seminars and the International Consulting Project. To learn more about the programme and better understand our unique offering, please do contact us before starting your application. An admission advisor would be happy to guide you through the programme and guide you through your personal goals. Access to a pre-MBA programme online right after admission. ESCP Europe is committed to supporting excellent candidates with scholarships in 5 categories: Women Leaders, SME's, NGO's, Entrepreneurs, Emerging Markets Managers.